Sara, of Unofficial Mom, is really one of the most official mamas you'll find! Like many, she is unable to conceive on her own. She has the most ADORABLE adopted little "Pie." I actually just finished reading Pie's birth story. Of course I shed a few tears. 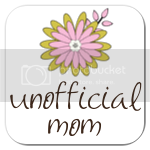 So Unofficial Mom is of course a blog about being a mom. But she's also hilarious. And crafty. An honest. And real. I love that. I realllllly hope she doesn't mind, but instead of posting photos, I wanted to repost something so touching from her blog. Read it, and then rush over and read so much more! I stare at her. And, yes, my mother did teach me it was rude. But I cannot help it. I stare and try to memorize every curve of her face, every line, crease, patch of rosy skin. I stare and I see nothing of myself, nothing of Husband. There is not a trace of my mouth, not a hint of his eyes. There are no discussions about the hair color that was passed down from this grandmother or the funny toenail that came from that uncle. We don't know those things. I stare and I see nothing of myself, nothing of Husband. I see her bio dad's face and her bio mom's coloring. I see all of her ethnicities shining through. They are not ethnicities that we share with her. They are hers and hers alone. I stare and I see everything important of mine and everything important of Husband's. I see the crinkle in her nose when Husband makes her laugh. I see her hands and feet fling with joy when I come home from work. I see the trust, the peace, the love in her eyes. I see the reflection of my absolute adoration all over her face. I stare and I see my daughter. That is so beautiful. What a gifted writer. All moms should possess that kind of gratitude for their little ones. Thank you thank you thank you! I am beyond touched and completely overwhelmed by your lovely words about my blog. Darn it! It's too early in the morning to be teary-eyed! I absolutely adore Sara and her blog (and of course sweet Pie!). Sara is one of those people that you meet online and hope someday to meet in real life because she's so smart, sincere, honest, and funny as all get out. I love Sara's blog - I found it when I was doing research on surrogate pregnancy. Her little Pie is too adorable. I love that she shares the ups and downs of parenthood in a real, not sugar-coated way. I hadn't been to her blog before. Thank you for sharing as I really look forward to following her now!